This booking form for the MacRobert’s First Spectacular Family Pantomime in 1978 – 1979 is one of a small collection of treasures gifted by Stirling designer Michael Chatfield. 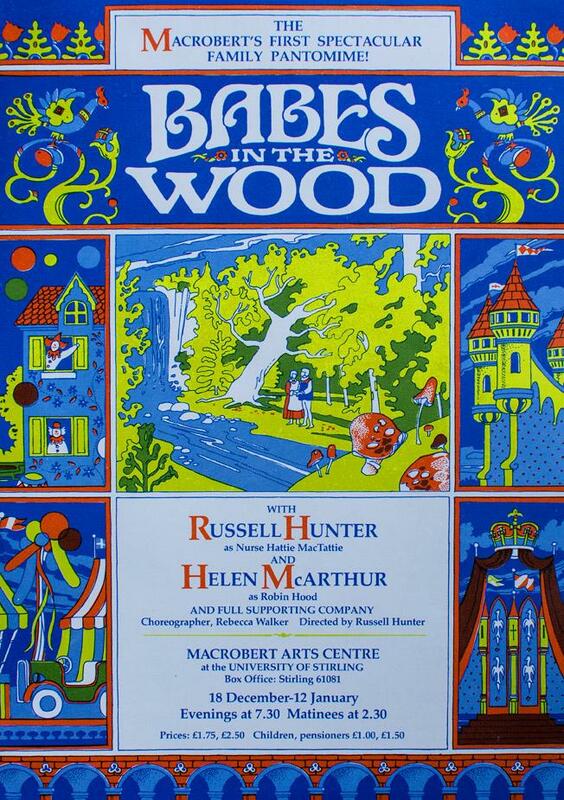 Forty years on, the MacRobert has one of the best of the traditional Scottish pantos, eagerly anticipated each year by the fans of Johnny McKnight, but it also started in a big way, with theatrical legend Russell Hunter (1925 – 2004) and singer Helen McArthur (1943 – 2005). Stirling is fortunate. The MacRobert Art Centre, established 1971 as Scotland’s first purpose-built arts centre, was the brainchild of the university’s first principal, Tom Cottrell FRSE, who wanted appreciation of the arts to be at the heart of the university’s cultural ethos. Every other Scottish university followed where Stirling led, but all did not succeed in the long term, as the closures of the Crawford Arts Centre (St. Andrews, 2006) and the Collins Gallery, (Glasgow 2011) showed. Michael, who trained at Camberwell and Edinburgh Colleges of Art, took his starting point from the MacRobert scenery sets. The art work was drawn by hand and the colour built up with overlays. Lettraset lettering was used, although Michael was trained in calligraphy and sign writing. The piece in now in the Smith’s ‘Stirling Christmas’ show.